Xiomara keeps her feelings to herself and in her journal. She knows her strict Catholic mother wouldn't understand her emotions about how she's treated in the neighborhood or her doubts about the church or the way she expresses herself in poetry or especially the way she's starting to feel about her science partner, Aman. As a teen, Xiomara's mother had planned to be a nun so she has strict expectations for ladylike, pious behavior for her family. Xiomara and her twin brother have even greater expectations placed on them for their lives because their conception was an unexpected miracle, happening after their parents had been told it was impossible. 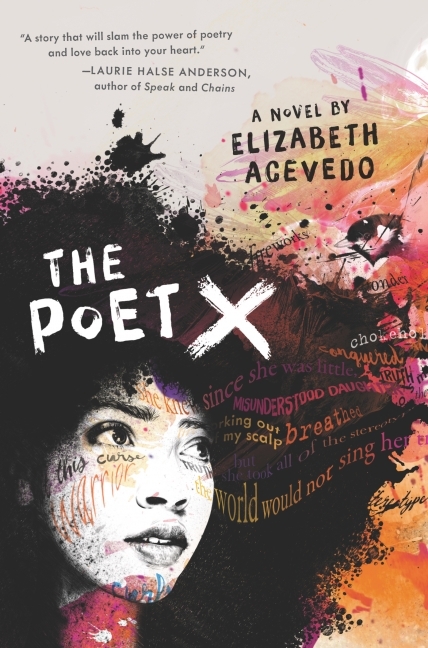 Xiomara has already put off her confirmation by two years and knows she has to complete it now, so she can't join her teacher's poetry club which meets on the same night regardless of how much she wants to be a part of it. But as her doubts and issues grow, so does her resistance to remaining silent about her life. I am blown away by this novel and I'm not often a huge fan of books in verse. Part of my objection to books in verse is that they do not appeal to my students but I know that will not be an issue with this book. I've seen only a couple videos of Acevedo performing poetry before reading this book and she is a powerful performer. She totally packs all of her performing skill into text, which is not easy to do with poetry since it is really meant to be a spoken art, but the poems here pack a punch over and over. I found myself a little dazed more than a few times where I sat and thought, and then went back and reread the previous passage to experience it again. And the scene with the journal? I literally gasped aloud and cried with grief over what was lost - and I don't mean just the stuff in the journal when I talk about what was lost in that scene. The mother/daughter dynamics are so real and raw and relatable. I know that part of what resonated with me is that I was raised Catholic (although nowhere near AS Catholic as Xiomara's family) and the doubts she expresses mirror some of what I was thinking as I grew up. As an ex-Catholic now, I still have affection for the Catholic church and their more liberal beliefs so I was also very fond of Xiomara's priest who is a wonderful sounding board for her and mediator with her mother. I can't wait to get copies for my school and get them into the hands of my students.